Daniel T. Kirsch, PhD, is an author who earned his doctorate in political science from the University of Massachusetts Amherst and now teachers at California State University, Sacramento. Kirsch, Daniel. 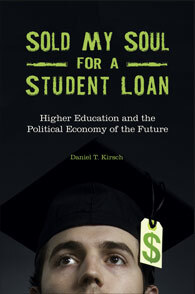 Sold My Soul for a Student Loan: Higher Education and the Political Economy of the Future. Praeger, 2019. ABC-CLIO, publisher.abc-clio.com/9781440850721. With unprecedented student debt keeping an entire generation from realizing the "American Dream," this book sounds a warning about how that debt may undermine both higher education—and our democracy.